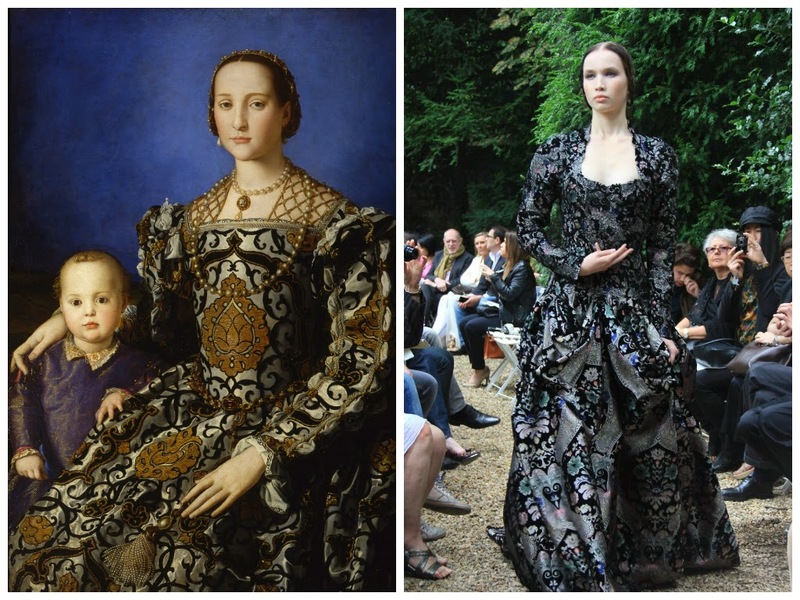 Left: Eleanora of Toledo, 1545. she wears a silk brocade gown with black arabesques motif and pomegranate pattern. The gold lattice-work partlet is studded with pearls. Blackwok embroidery is just visible at the edges of her square-necked chemise. Right: A gown from a collection titled 'Metamorphose', a series of intricate garment construction of Frank Sorbier Haute Couture Fall 2013 (tab here for the complete ollection). Frank Sorbier always has a nature-inspired appoach to his collection, and this one, combining the stiffness of an armour with softness of the sense of beauty he's trying to translate into cutting and sewing, resulting a gown that resonates the beauty from the past; sometimes there are some beauty that can transcendent through time.